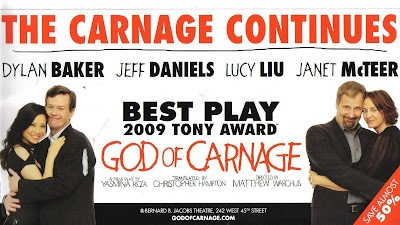 I'm finally seeing God of Carnage! It started previews last year on February 28th and is now on it's third cast. The play, by Yasmina Reza, won the 2009 Tony Award® Best Play, 2009 Tony Award® Best Actress in a Play for Marcia Gay Hardin in the role of Veronica, and 2009 Tony Award® Best Direction of a Play for Matthew Warchus. The main reason I am finally getting around to seeing it: JANET MCTEER! She originated the role of Veronica in the West End.